These came in the mail today, a WIX NAPA version of the 427 Cobra and a Motormax 2005 Ford GT. The WIX Cobra is the Elvis Presley Spin Out movie race version without windshield and is up to their usual high standard but I am a bit disappointed in the finish on the side pipes. The side pipes which are prototypically correct for the movie car but look so much better on the blue and silver WIX Cobras. Franklin Mint released the same Spin Out model but with a guitar. The Motormax Ford GT is pretty much standard fare but I wanted to include this year in my diecast Ford GT collection. It is a bit strange that there are no side windows included. I do prefer the Revell Snap Tite version though. Aw now you've gone and done it. I'll have to get some pictures of my most recent things. Last week was the DM 41 Cadillac, 55 Ford in purple/white, 31 Ford delivery Budweiser truck, and 31 Ford roadster. Soo I'm laying low right now. Not sure what will be next. Nice pieces btw. Agreed on the windows - why? I bought a nice Jouef 1/18 GT40 in Gulf colors many years ago and it was missing hte side windows. Had to fab up a set. Cobra is cool as well. Hard to beat those Wix Cobras. Why are they not still doing this stuff???? Didn't "get" one today, but the other day I found one I bought a year or more ago and had pretty much forgotten--Maisto '64 Ford Thunderbolt. For some reason I got interested in doing it and got about half the work done on it yesterday. Should finish it up today, or tomorrow latest. Got it all done today except the side trim, which I should finish up tomorrow. I had it sitting on the bench next to an AMT AWB '65 Falcon I'm working on and noticed they're almost identical in width. Did some research and measuring and discovered that both the wheelbase and overall length are just a hair over 1/25, but well short of 1/24. Woohoo, it can sit on my 1/25 shelves! I picked this up at CVS a couple of weeks ago. 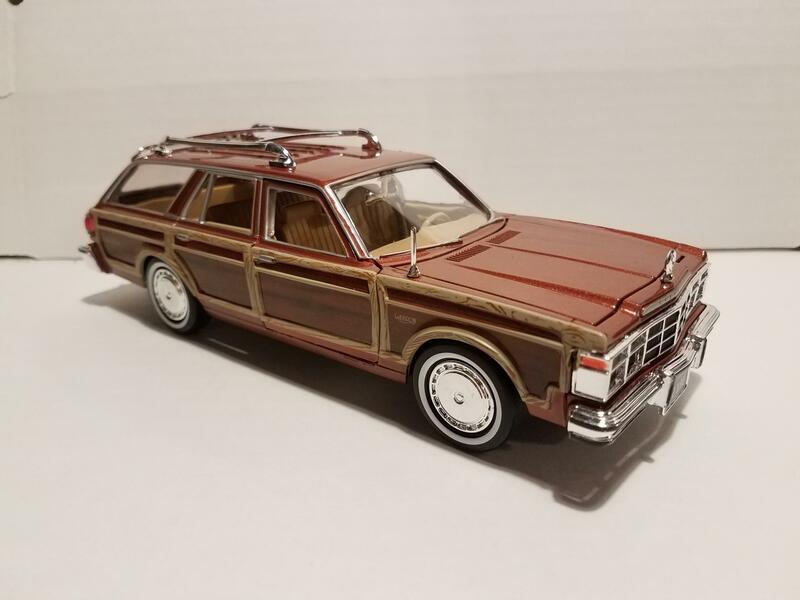 I'm a sucker for wagons and the woodgrain on this one spoke to me, lol. 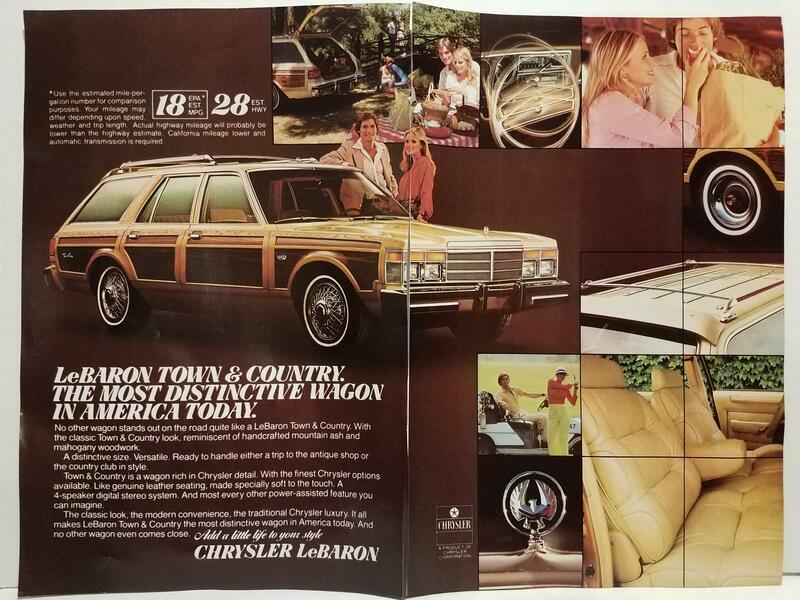 It's a Chrysler LeBaron Town and Country made by Motor Max. I thought I'd just add it to the shelf. Then later that night, I was cutting car ads out of some old National Geographic magazines I was cleaning out of my parents house and I came across this ad. I thought it was a sign, lol. What are the odds of that happening? Pretty cool to have an ad for the real macoy for such an obscure diecast subject. 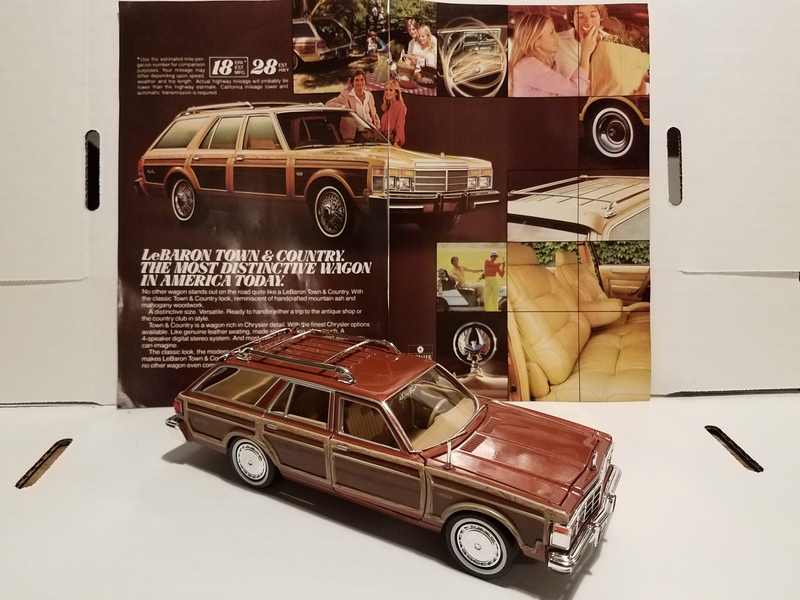 The ad was from a 1979 issue and the bottom of the diecast says it's a 1979 model. Cool. I guess I should have played the lottery that night too. Oh well. Nice, fairly accurate diecast for $13.99. Now, I'm hooked on these inexpensive diecasts too, lol. I just saw one of these today while grabbing some medicine at CVS. My dad pointed it out. I think it's pretty cool too. I also got a Holy Grail die cast in the mail today; my last AMC for my collection, a Rebel Machine! Thanks for sharing the ad and the LeBaron. I recently picked one up too. Makes a great tow vehicle for a trailer. Mailman just delivered my Johnny Lighting Shelby GT500, Sunday package delivery still surprises me. I am pleased with the model but there were a few things my "advisors" here did not prepare me for. The chassis is diecast too, never seen that before. There are ridges between the stripes on half of the roof and on the trunk, kind of strange. And as already mentioned the tail lights need the bezels picked out with silver. 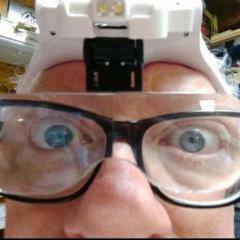 The hood scopes need a touch of black where the stripes are. I like the color, a good Shelby color. 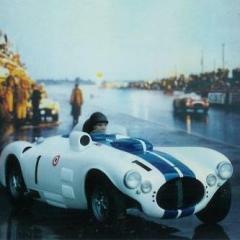 Nice score on the WIX Cobra - I have not seen many of them compared to the blue one. The JL GT500 isn't perfect as you know but the retail was about $25 at the time so the quality is about right. The diecast chassis is a little odd. Looks like the wheels could use some detailing and along with the backup lights. 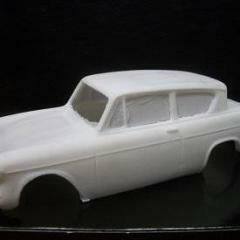 I like the Revell one more since it is kit you get to detail it to your liking without having to paint the body. Mailman just delivered my Johnny Lighting Shelby GT500, Sunday package delivery still surprises me. I am pleased with the model but there were a few things my "advisors" here did not prepare me for. The chassis is diecast too, never seen that before. I think I've mentioned the metal chassis on Johnny Lightnings before, possibly re the '69 Camaro. These things are HEAVY. They could be used as deadly weapons. Seriously, I've got a few handguns that actually weigh less. Love the Le Baron! First thing I'd do is take that antenna off. Save it - makke a good shifter if it had a ball. LOL. But that really makes me want one to see how they turn out with some real modeler detailing on it. I googled the 67 gt500. 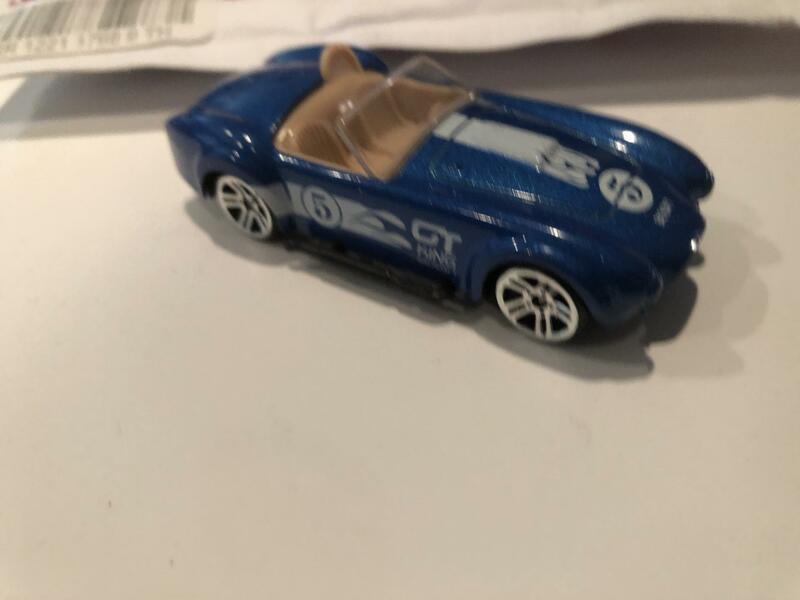 there is a subtle ridge on the roof and trunk of the real car. Probably more subtle than the diecast. See this. You could remove stripes for one similar to this as well. I do like the diecast chassis. They respond well to standard detail painting like an old one piece chassis except better molding now. I really don't mind the chassis plate being one piece. Again, the only person that sees the bottom of my cars and would know or care the difference is me. I could use a flat plate with axles crudely glued to it and the people that look at my cars would not know or care. But I do usually paint the details that are presented. Nice score. I got to remember to take some photos of my recent scores. Mailman brought a Franklin Mint 55 Caddy Elvis car yesterday. Whole thing with all boxes, papers, and guitar for around $50 delivered. My last big diecast purchase for a while - spent a ton at Lowes over the weekend on a new riding mower. There went my Paypal fun money. I have been fortunate to sell off some of my stash which I realized I never would get built. With the proceeds I have been able to purchase some diecasts which I have had my eye on for a long time. With that being said I pulled the trigger on this Danbury Mint Aston Martin DB5 for a reasonable price. I am very pleased with it and the leather covered seats are a marvel. The only thing I plan to do is tone down the spokes in the wire wheels a bit. Picked up a couple Dodges recently................2003 and 2004 . Team Caliber are nice. I have their 1963 Corvette and it is very well done. I like your clock too. You have picked up some nice diecast Fords there Gary, and I like the Danbury Mint Aston Martin as well as the WIX Cobra. 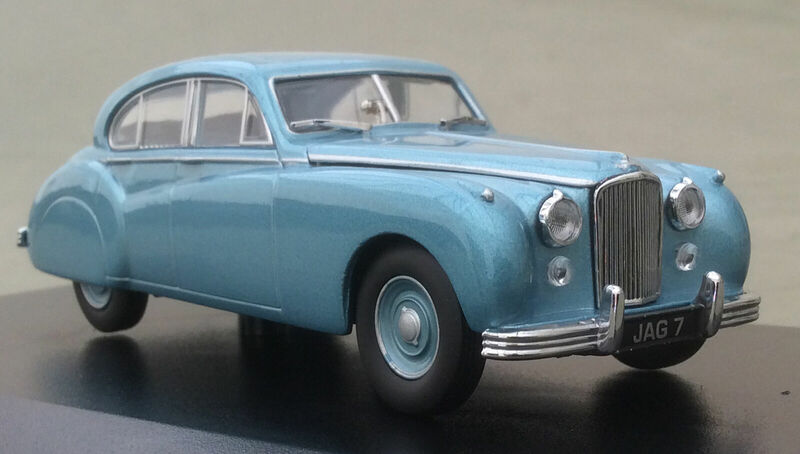 Gradually building up my 1:43 diecast collection for the second diorama that is currently under construction..... here is a car that I ordered yesterday from Ebay., which is a Jaguar MK VII. It is hard to believe that that is 1/43. And the hood opens too! Well Gary.... 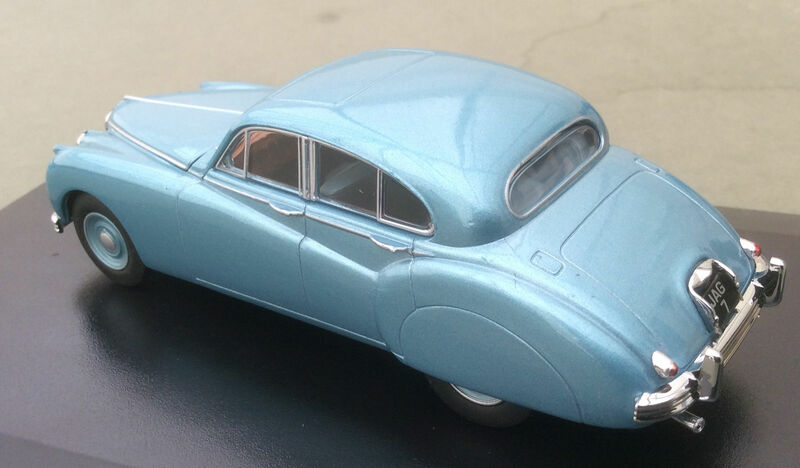 I thought exactly the same as you, in as much as the hood looks like it opens, but as far as I know, none of the Oxford Diecast model cars have opening parts at all. The Jaguar hasn't arrived yet, but it's due any day now so I 'll have a good look. It is indeed a nice model in 1:43 scale. This little Cobra arrived from Thailand today . 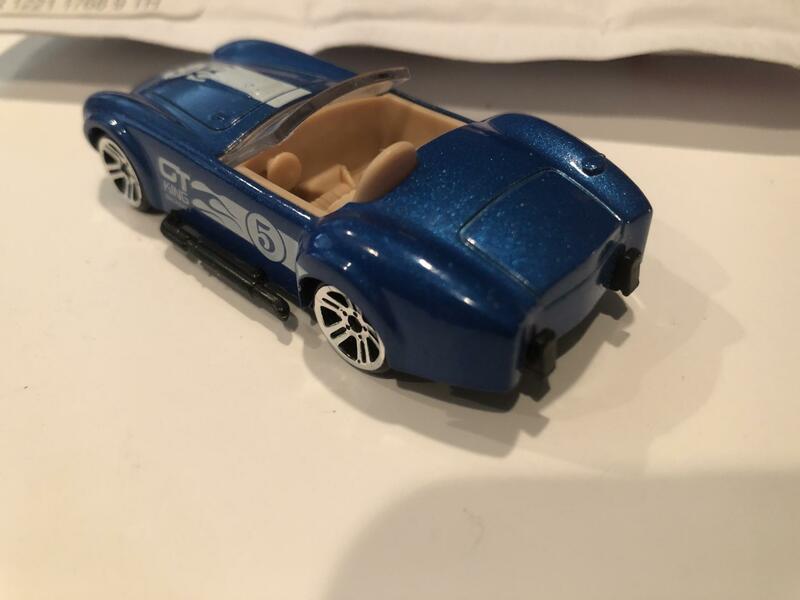 About Hotwheel size but not a hotwheel . Paid 1.29 with free shipping . Another one for the collection . Bulletproof glass in the windshield! Yes ! Up to and including a .50 BMG !